Initially the first forms of electrolysis came into use for aesthetic purposes in the 1800’s. This included the insertion of giant cathodes into the skin, to send electrical currents, to prevent hair growth. Side effects included severe pain, discomfort and scarring. Laser hair removal proceeded electrolysis, which was a much safer form of hair removal. Therefore, this means the individual’s skin type is catered, for resulting in less surface scarring. Lasers function by targeting the melanin within the hair follicle. At Clear Medical we recommend electrolysis for white/blonde/red hairs as an option for long term removal. However some laser companies promote they can treat light hairs, they may be blonde/white/red hairs with dark roots (still not as efficient as the full follicle being dark). We question the science behind the theory of treating non dark hairs and efficiency to the consumer. 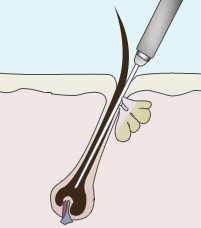 Efficient Electrolysis functions by sending an electrical pulse through a single micro needle into the hair follicle pore, to damage the cells that facilitate hair growth. However, minimisation of discomfort, scars and pain is possible by a modern well calibrated machine and a dedicated experienced Practitioner. Pricing is usually in time bands, as the practitioner will target each follicle separately. Check to see if they have registration with a body? This means you can report a complaint. Treatment time is money and efficiency, so don’t talk when treatment is going on – pricing is usually in minutes. Ask questions to ensure the use of micro-needles, carrying out regular maintenance and calibration or service of the machine and year of purchase of the system (older devices have larger needles that will cause more negative side effects). Does your practioner cleanse the skin priorto the treatment; and is post treatment and sterile aftercare advised? This is due to our belief that if you are professional in treatment ethics and practice, this portrayal will be evident in all aspects of care. http://www.sterex.com (A well-established electrolysis manufacturer so that you may ask for their newest system and possible practitioner). Feel free to have a look at the following link to find a professional: https://www.sterex.com/storelocator. Also, please feel free to email us back if you’ve had a great experience and we will be more than happy to recommend them here.